"Have a good day at work today!" From the popular web manga and anime series Tawawa on Monday, comes a Nendoroid featuring the main heroine Ai-chan! She comes with three face plates, including a standard face, a winking expression and a suggestive glaring expression. She also comes with a smartphone, which can be placed on her bust to replicate the popular illustration seen in the manga, a school bag, and another bag with her part-time uniform inside. 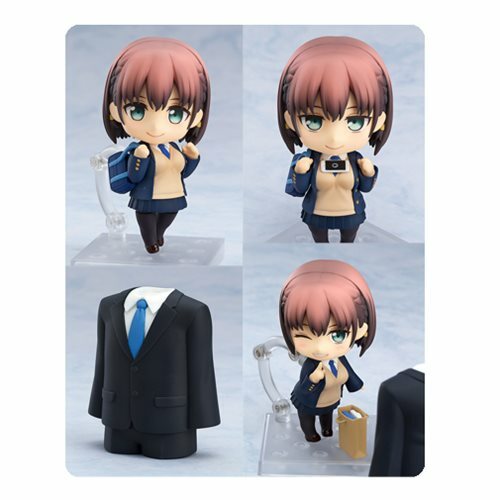 This Nendoroid also comes with an alternate bust, featuring soft breasts, and an office suit finger puppet! This Tawawa on Mondays Ai-chan Nendoroid Action Figure measures approximately 4-inches tall. Ages 15 and up.